Inspector Felix Zhou Xun proud to be the only police of Asian origin in the state of Sachsen-Anhalt, Germany. For years, he has been teaching martial father with Viet Vo Dao . Felix Zhou Xun, born in Halle, 23 years old this year is the police inspector. Felix’s father is Chu Tan Cuong, Vietnamese grandmaster man and his mother is German. For years, he has been teaching martial father under Viet Vo Dao. He has repeatedly been invited to perform martial arts for German TV. Over 1 year, Felix Zhou Xun perform inspection tasks in the city police and the district Bernburg Salzlandkreis, but from next September, he will move to Halle, where the family lived. Here, he also has a brother and three of his half sister. All of you are the father is Chu Tan Cuong Dai sensei taught martial should be very close, intimate with each other. Chu Tan Cuong, 53 years old, has been studying martial arts since childhood in Hanoi, Vietnam, then to university in Halle. Felix Zhou Xun perform at the Festival “Integration and Development”. In the 1980s, he studied martial arts Vietnam improvements to conform with the structure of the European body. Shortly after German reunification, Chu Tan Cuong opened the first martial arts school and has so far opened 20 schools throughout Germany. He repeatedly been invited to perform on television and so far, he has established 15 world records. He was invited as a consultant for many business leaders as well as Interior Minister Holger Stahlknecht Saxony-Anhalt. Although not by the father, Felix Zhou Xun also been invited to perform on television station Pro 7 and MDR. He has also founded two record on the television program showed his ability to master his body. Felix Zhou Xun said, it is important to keep the balance of yin and yang, keep the balance between intellectual and physical, that is the premise of learning martial arts. But the most important thing is qigong. Breathing properly have a decisive impact, but one must have the discipline to focus and be able to learn new techniques Inspector Felix Zhou Xun police also said Vietnam Vo Dao studies can be useful to him in life private life as well as in the work of the police, especially in difficult situations, forcing a police inspector to be calm, master of the situation and act urgently. 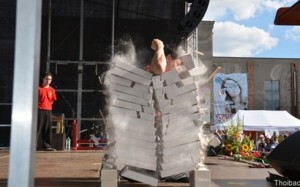 At the Festival of Integration and Development in Dong Xuan trade center last June 28, on the occasion of the 40th anniversary of establishing diplomatic relations between Vietnam and Germany, Felix Zhou Xun also attended and performed more Items used two broken arms and two piles of bricks, each stack of 15 members, impress on visitors.